For much of the past 25 years, the Academy Award for Best Original Screenplay has functioned as a consolation prize given to movies too personal, unusual, or inventive—which is to say, too good—to win (or in some cases even get nominated for) the big Best Picture prize. Pulp Fiction, Fargo, Almost Famous, Lost In Translation, Eternal Sunshine Of The Spotless Mind, Her, Manchester By The Sea, and Get Out are among the winners in the category that seems perhaps likelier than any other at the Oscars to honor future classics. Its sibling award, Best Adapted Screenplay, feels like more of a hodgepodge by comparison. Sometimes it similarly rewards a Best Picture also-ran (and better-than), like The Social Network or Brokeback Mountain. Sometimes it matches (for better or worse) Best Picture, a category where a lot of recent big winners have been adapted from a book. Once in a while, it seems to pay tribute to the difficulty of the adaptation at hand. If the award has less of a clear identity than Original Screenplay, it probably has to do with some fuzziness of intention: Is the Best Adapted Screenplay the best screenplay that happens to be based in another medium, or the screenplay that does the best job translating its source material to the screen? The ambiguity is part of Oscar history; the writing categories themselves took a while to sort out, as early Oscars cycled through categories like Best Story, Best Adaptation, Best Screenplay, and Best Original Motion Picture Story, sometimes overlapping, and not always meaning exactly what they sounded like. The awards took their current forms (save some mild rewording) in 1957, yet the most-versus-best ambiguity continues. The brilliant Adaptation, about adapting a potentially unadaptable magazine article into a screenplay, was nominated but also lost in this category. That Academy members passed on a chance to award a movie about the struggles of screenwriting indicates that the distinction is still not entirely clear. In strictly categorical terms, the screenplay-that-happens-to-be-adapted description seems closer to the original intent. Movies based on real people but lacking ties to a single credited source, like this year’s Vice, Green Book, and The Favourite, compete as original screenplays, making the distinction at least somewhat technical. Even so, the very act of categorizing these screenplays and films still sparks thought about that adaptation process and how it affects the final film. Some of this year’s most likely Adapted Screenplay nominees, for example, have weaknesses in exactly that area. The newest version of A Star Is Born hews pretty closely to its three predecessors, and if it’s been superficially updated to 2018 by Bradley Cooper and company, much of its charm derives from its status as an old-fashioned weepie and its close-up-heavy filmmaking and performances. If Beale Street Could Talk is also more of a triumph of directing and acting than writing; its less graceful moments have to do with writer-director Barry Jenkins wrestling with novelist James Baldwin’s tricky-to-adapt prose. Questions about adaptation are similarly difficult to avoid when considering the less likely nominee The Old Man & The Gun, adapted by writer-director David Lowery from a non-fiction New Yorker article by David Grann. If Old Man was ever under serious awards consideration, it would be for Robert Redford’s wonderful and potentially career-capping performance as real-life and lifelong bank robber Forrest Tucker. 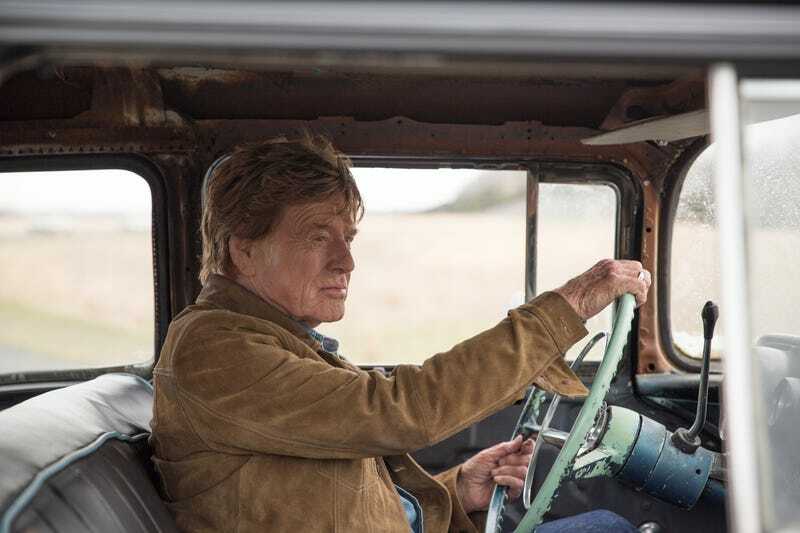 But while the movie takes clear and clever advantage of Redford’s career mileage, Lowery’s screenplay is a low-key marvel, both on its own and as a work of adaptation. Though writer-directors can make the line between their two main tasks especially blurry, The Old Man & The Gun is economically and elegantly told on a writing level. It moves quickly, yet not hurriedly. The relationship between Redford’s Forrest Tucker and Jewel (Sissy Spacek), who seems to be a heavily fictionalized version of the real-life Tucker’s third wife, develops both through charmingly written dialogue scenes and well-conceived moments that don’t rely on talk, as when Forrest quietly demonstrates how to make off with an expensive necklace before Jewel, just as quietly, convinces him to turn back and pay for it. The other members in Tucker’s “Over-The-Hill Gang” are sketched with comic skill, and a key conversation during a chance encounter between Tucker and obsessed lawman John Hunt (Casey Affleck) is written as perfectly loaded small talk. While Lowery’s previous film, A Ghost Story, arguably found strength in pure direction, The Old Man & The Gun makes perfectly spare use of its plainspoken words. Sparseness might not be the expected tactic for adapting a single magazine article, even one that approaches 10,000 words, into a feature film. Instead of expanding and elaborating, Lowery judiciously prunes away much of Forrest Tucker’s remarkable life story in a dual act of fictionalizing and eliding. No mention is made in the film of his stay at Alcatraz. His origins aren’t fully dramatized on screen. His elaborate escapes are compressed into a thrilling but brief flashback montage. Family members are composited into a single scene with an unbilled Elisabeth Moss. And any scenes causing bystanders more than the briefest of momentary distress are omitted. Lowery does make judicious use of the piece’s many finely observed details, like the handwritten list of Tucker’s prison escapes that includes a blank final entry, and the homey comfort Tucker finds after he’s released from prison and before he decides to jump back into robbery for old time’s sake. But despite using Tucker’s real name, the film feels adapted from impressions of the article, not necessarily its full narrative. Redford’s signature outfit in the movie, a blue suit and a fedora-like hat, isn’t mentioned in the text at all; they appear in an accompanying illustration that itself is more an idea of Tucker than a true portrait. There’s also the second, uncredited source of Redford’s screen career, where he’s played charming rogues and outlaws throughout the varying likes of Butch Cassidy And The Sundance Kid, The Sting, Sneakers, and The Company You Keep. The script may have been written before Redford joined the project, but his presence teases out the subtext (an actual text in the Grann piece) that Tucker must see himself as some manner of old-timey outlaw/hero. These details don’t necessarily make The Old Man & The Gun more or less worthy of an Adapted Screenplay nomination than, say, BlackKklansman, which also tells its own fact-based story with plenty of creative liberties. (This year, the perennial Oscar-season distraction of fact-checking the candidates is zeroing in on Green Book.) But in addition to strong writing on its own, and given that it’s competing against other screenplays based on pre-existing material, it’s worth noting how creatively Lowery is able to weave together a New Yorker article, Redford’s persona, and his own preoccupations with ’70s-style moviemaking. There are other underdog contenders in this category that perform similar magic tricks. With Burning, Lee Chang-dong and his cowriter Oh Jung-mi expand a particularly brief Haruki Murakami short story into a drawn-out, enveloping mystery. And Spider-Man: Into The Spider-Verse pulls together stacks worth of comics into a coherent single story, adds plenty of great jokes and heartwarming moments, and still manages to feel like the work of a singular voice, rather than an animation-studio committee. If singling out imaginative adaptations risks turning Best Adapted Screenplay into yet another Oscar category subject to the excesses of “most” rather than “best,” it’s also not necessarily fair to keep it (unofficially) subservient to its “original” counterpart. Movies like The Old Man & The Gun show just how much originality can be worked into the act of adaptation.